A project borne of myth, mystery and shadow play in eighties Los Angeles gets gloriously animated for the 2016 stage: meet Breadwoman, the character that embodies US vocalist and performance artist Anna Homler’s practice of divining speech, lyrical fragments, and melody for music, with the fluid synthetic excursions of Steven Warwick aka Heatsick as her modern-day accomplice. Originally recorded in 1985, the album Breadwoman & Other Tales found Homler in musical dialogue with electro-acoustic composer and LA avant-garde contemporary Steve Moshier, on a set of otherworldly spirituals delivered in an invented language by Homler over Moshier’s rich and strange production. To mark the reissue of this unheralded landmark album by the RVNG label in February 2016, Homler will give rise to Breadwoman again for a series of very special mixed-media performances, with Warwick rechanneling Moshier’s material for the live realm. 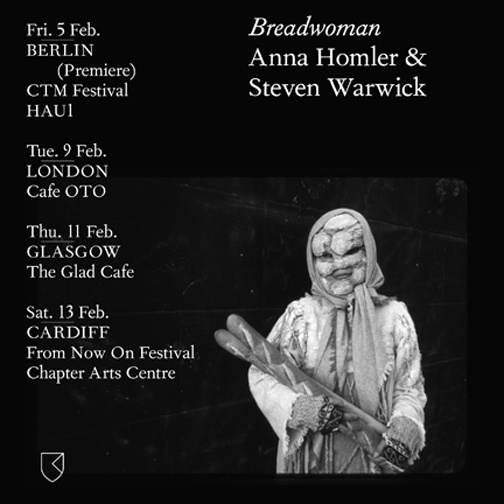 Posted in Concerts and Performances and tagged as anna homelier and Steve Warwick breadwoman, bread woman anna homelier, bread woman from now on festival, Breadwoman berlin tour, cafe oto london performance breadwoman february 2016, cardiff from now on festival anna homelier, chapter arts centre festival 2016, CTM festival breadwoman, glasgow the glad cafe bread woman, London breadwoman anna homelier, Premiere breadwoman berlin.